One of the activities that occurs each year at the International Embroidery Conference is the collection of home made blankets for the children of our soldiers who are engaged in active duty. 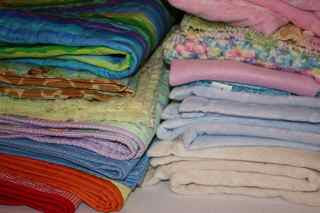 The majority of them are quilted but not all. Some are crocheted, others knitted, or are created out of soft cuddly embellished fleece. Once gathered in the main room where the presentation will occur, the donate-rs participate in the Parade of Quilts allowing everyone present to enjoy the talents of their new friends. The best part for me is the presentation of quilts to the soldier who arrives to collect them. Naturally, we are all inspired by his words of commitment and not a dry eye is left in the room when he is finished speaking. This year the last night of the show was called the round up and most were dressed the part. This little lady is Betty O'Brien and she heads up the IEC. She also manages to pack up a red hat for me to wear. During a conference, people attend classes on various topics including: digitizing, hands on sewing, stabilizers, how to run a business and more. But the one thing that everyone studies together is shopping. Lots of vendors line the hallway and a small ballroom with all kinds of "much needed items" to help the attendees. So imagine, there I am selling Sock Easys, and through out the course of the event people keep telling me that Allene Snow of Snow Lady Designs has a design that reminds them of me. For the first two days I thought she put people up to it, but then I finally made it over to her booth, while she was teaching in a classroom. Okay, now you be the judge. 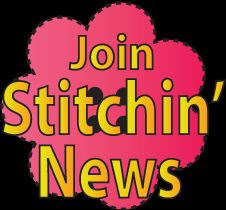 Cindy Allen sent me a picture of it sewn out. I have to admit the hair style and the color are darn close, and I do love cute shoes. Sometimes I do slide my glasses to the end of my nose. So is this my caricature double? If you think this is funny then see the rest. The set is called "Going Sewing" and I have to decide what I plan to stitch it out on, because whether or not it looks like me is just coincidence but the set had so many fun things in it - I now own it. It looks just like you! 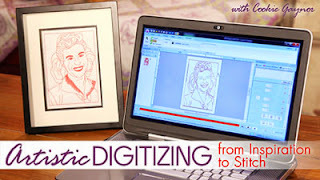 What an honor to have someone "digitize" you and get it so right. I sure missed being with y'all and know everyone had a great time. Doing better but still not perfect - yet. 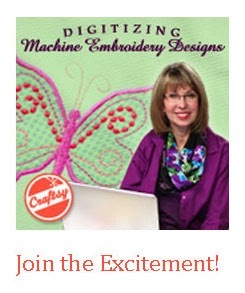 I think our talented Allene, created the design first and stepped back and said, "oh my, she looks familiar!" Your talent was missed at the show.